In a report issued Thursday, the National Transportation Safety Board determined that the sinking of the fishing vessel Lady Damaris probably had a straightforward cause: an unrepaired leak in the hull, which was known to her crew two weeks before the accident. On June 8, the Damaris left her home port of Brownsville, Texas to trawl for shrimp off Louisiana, and she brought in 6,000 pounds of catch between June 10-18. Throughout the voyage she was taking on a small amount of water in her engine room, and the crew had to pump out about once every 48 hours. The four crewmembers didn’t identify the source of the leak. On June 19, 2017, the master of the Damaris sought to ride out the named tropical storm Cindy at anchorage off Port Fourchon, Louisiana. 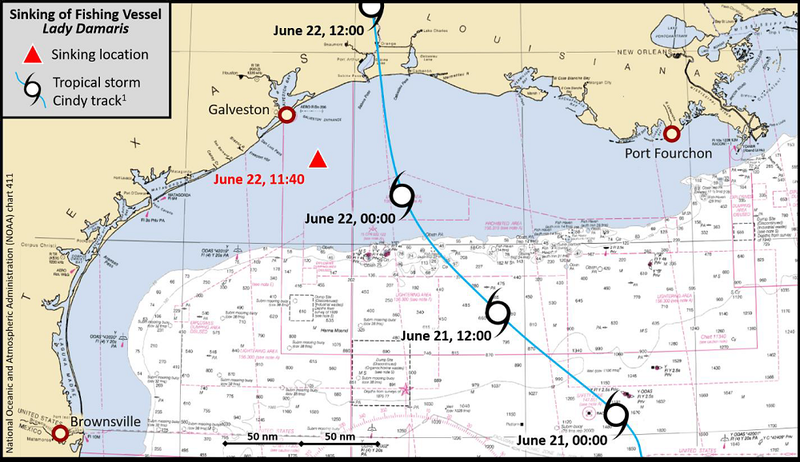 However, the Damaris’ anchor line parted in the early hours of June 20, and the captain decided to head west towards Galveston to outrun the wind and waves. The storm system strengthened, and wave heights approached 14 feet, according to crewmembers’ accounts. On June 20-21, the rate of water ingress increased, and the crew had to pump out the engine room about once every two hours. The crew shut down the engine late on June 21 to search for the leak, and in the early hours of June 22 they found a three-inch hole in the freezer hold below the tail shaft. Their attempt at damage control involved inserting rags and the handle of a hammer into the hole. The crew left a valve between the freezer hold and the engine room open so that they could continue to use the engine room’s bilge pumps to dewater the compartment. They also put a portable electric pump into the freezer hold. However, by about 0400 hours, both pumps became clogged with debris and stopped working. The crew attempted to plug the hole with more rags and wood, but it simply became bigger, they told investigators after the accident. They restarted the engine and made way for Galveston once more, and the flooding continued. By the time they were 30 nm off Galveston the engine compartment was about one-third full of water. 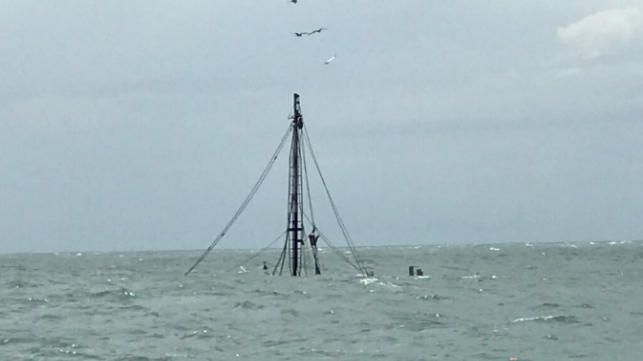 At 0903 hours, the crew made a distress call over VHF, which was picked up by Coast Guard Sector Galveston and the good samaritan vessel Ajax, an OSV. The Ajax arrived on scene by 0914, and at 0925, the Damaris lost power and propulsion. A Coast Guard helicopter and a small rescue launch arrived shortly thereafter and relieved the Ajax to resume her voyage. The USCG personnel brought three portable pumps on board the Damaris and attempted to dewater her, but were not successful in reversing the flooding. The commanding officer on scene determined that the Damaris was no longer safe at 1121, and the Damaris capsized and sank 15 minutes later, spilling about 5,000 gallons of petroleum and sending $210,000 in frozen shrimp to the bottom. In a post-accident analysis, the NTSB noted that the 1971-built Lady Damaris had previously had welding repairs to her hull, and the location of the hole was in an area prone to corrosion, suggesting that the leak was the result of deterioration of the hull plating. However, the proximate cause of the casualty was likely human error, NTSB determined. Since the Damaris had been operating for 14 days with a known leak, and the master could have opted to interrupt the voyage to seek repairs in port, “the probable cause of the flooding and sinking . . . was the captain’s decision to continue to operate with a known hull leak,” NTSB wrote.